And another Friday is upon us, which means two things, The Dressing Room, and Fifty Linden Fridays. Both events that I die all week just waiting for them to happen and open up. 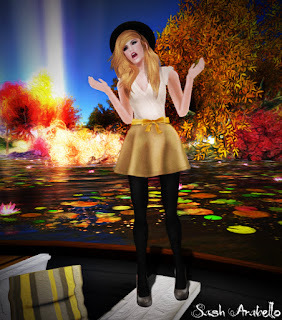 And well, there were some few amazing things that are going on today on Fifty Linden Fridays and TDR! For one, Ingenue is part of this weekend's line up, and they came up with this new adorable skirt, and one of them, the yellow one, is available for only 50L today, so you better hurry up and get it before it goes back to full price! Then Deco is in the line up too, with these adorable mesh sequined pumps. Essences is in this week's line up for the TDR, and it doesn't dissapoint, it has a 70L Skin out, and with a couple make up choices for you to add. If you wear Essences skins, even if you don't care for the paleness of this skin they have up for grabs this week, the lipgloss options are totally a must for any of their skins, so I'd suggest you rush over and quickly grab them before they're gone in two weeks!